The cutting action of the San Lorenzo River and movement on the Ben Lomond Fault are the primary forces that have shaped this park. The main Henry Cowell unit has two distinctly different kinds of rocks: hard granite and schist formed from magma in the south and soft sandstones and mudstones in the north, with fossil evidence (including sand dollars and shark teeth) that it was once a shallow inland sea. The park’s plant communities often reflect those differences in geology. Northwest of the main unit, the Fall Creek Unit is rich with limestone formed by fossilized layers of tiny sea creatures. In the 19th and early 20th centuries, some of this limestone was heated in kilns built on the North Fork of Fall Creek. That produced the lime used in mortar and plaster—staples of the building industry. Hundreds of thousands of cords of redwood were burned over the years to keep those kiln fires blazing—baring the hills. Eventually, raw limestone and log supplies dwindled as concerns about deforestation arose; lime processing here ceased. The Fall Creek kilns closed in 1919. Today, the old lime kilns can be seen along the South Fork Trail. The second-growth redwoods nearby testify to nature’s resilience as the hillsides become forested once again. The tallest redwood in Henry Cowell Redwoods State Park is approximately 1,500 years old and 277 feet tall—just 28 feet shorter than the Statue of Liberty. California bay trees, tanoaks, and hazelnuts adapt to the shade beneath the redwoods. Clover-like redwood sorrel carpets the forest floor, along with wild ginger, trillium, and milk maids. The nearby San Lorenzo River supports a remarkable streamside (riparian) ecosystem. Large western sycamore, black cottonwood, white alder, and California box-elder trees offer cooling shade for river inhabitants. The arroyo willow stabilizes the river’s banks. On the ridgetops of the sandhill ecosystem, drought-tolerant plants with long taproots flourish in the sandy soil. Here, in one of only five similar communities worldwide, ponderosa and knobcone pines grow along the ridgetops and surround the park’s observation deck. Manzanita, bush poppy, chamise, sticky monkeyflower, and ceanothus all bloom in spring. The Ben Lomond spineflower and Ben Lomond buckwheat, found only in this area, add to the distinctive Santa Cruz sandhill ecosystem. A list of the park’s trees and shrubs is available online. Above the grasslands, look for white-tailed kites hunting for their next meal. Along the San Lorenzo River, listen for the belted kingfisher and catch a glimpse of the great blue heron. This year-round river is also a spawning ground for endangered steelhead trout. In the forest, you’ll hear the melody of the Pacific wren and the clicking sounds of the dark-eyed junco. Pileated woodpeckers hammer on trees. Look for banana slugs moving along the path and western gray squirrels leaping from limb to limb. In the chaparral of the Santa Cruz sandhill plant community, the wrentit’s descending song and the scrub jay’s screeching calls fill the air. Coyotes, bobcats and black-tailed deer roam freely. Two insect species that live nowhere else on Earth, the endangered Zayante band-winged grasshopper and the Mt. Hermon June beetle, may also be seen. A bird list is available. Fire has shaped the park’s rare Santa Cruz sandhill community, creating a unique mix of rare plants and animals, including the silver-leaf manzanita, Santa Cruz kangaroo rat, and Mount Hermon June beetle. 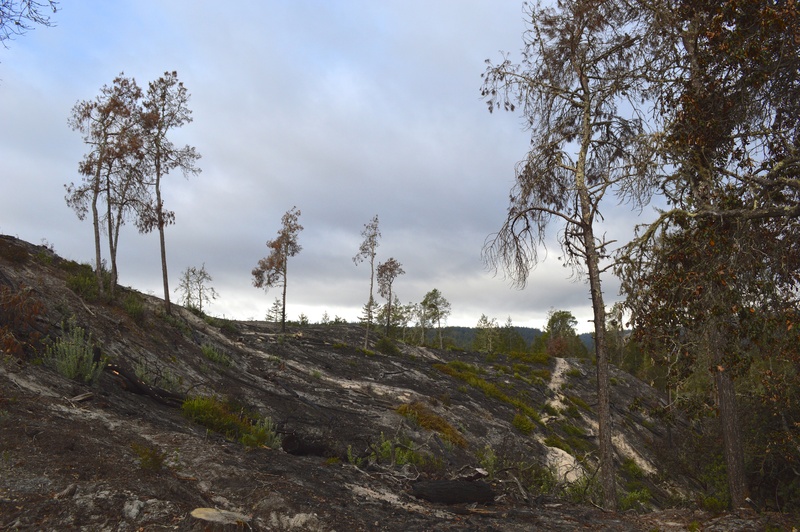 Fire’s role in maintaining natural areas was not fully understood during the last century. This led to a policy of total fire suppression. Without fire, the irreplaceable plants and animals found here were disappearing. Now, California State Parks is actively re-introducing fire to preserve this community. During the winter, workers cut vegetation to be burned into piles, making it safer to burn in the winter/spring months. 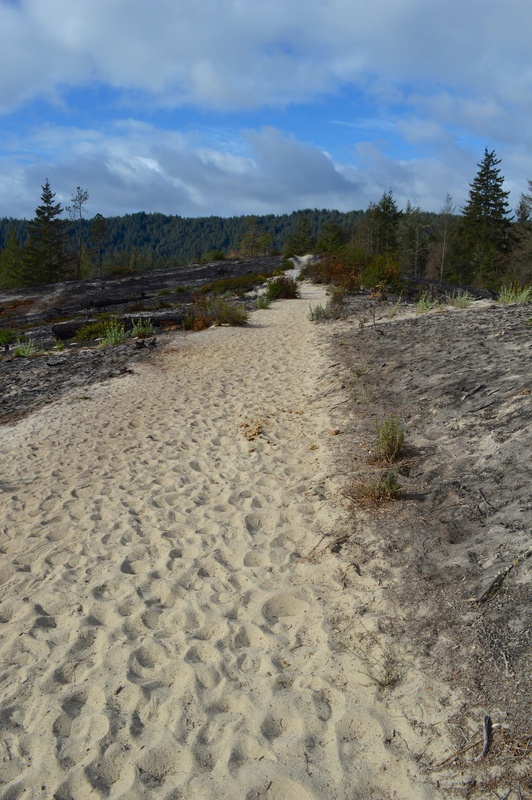 These controlled burns benefit not only the plants and animals that live here, but will also reduce the risk of a catastrophic wildfire that could pose a threat to the neighborhoods surrounding Henry Cowell Redwoods State Park. You can view past burns along Ridge Fire Road and Pine Trail near the Observation Deck. In this time of climate change, redwoods are an asset. Their size and longevity help them store more climate-altering carbon dioxide than other plants. Even old redwoods continue to grow, each year adding more carbon-filled wood than smaller, younger trees. After redwoods die, their rot-resistant wood keeps that carbon out of the atmosphere for a long time.